Users of the Web-based Basecamp project management tool have plenty of options at the App Store for accessing Basecamp on the go. But of the half-a-dozen or so Basecamp-friendly apps, I like Encamp, which stands out thanks to a speedy interface and good workflow. Project-Focused: Encamp, a mobile app that access the Web-based Basecamp project-management tool, lets you view all the projects on your account with a tap of the Projects Tab. Encamp allows you to access all the things you would expect out of a Basecamp app—projects, messages, to-do’s, milestones, and more. 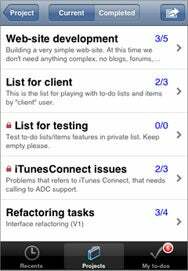 The app from developer Alexander Batalov has three main tabs: Recents, Projects, and My To-Dos. Recents allows you to get an overview of your Basecamp site. My To-Dos provides a quick listing of the to-dos that are assigned to you. The Projects tab is where the action is, though. From here you can view all the projects on your account and drill down to view and edit the messages, to-dos, and other information associated with a project. Since no information is cached on the iPhone, Encamp requires a network connection at all times. Even then, syncing is fast and information loads up fairly quickly even on the EDGE network. Encamp has some limitations; you can’t view files related to a project nor can you view attachments for messages and tasks. Since the iPhone can handle PDFs, Word documents, images, and other common file types, it would only make sense to have the ability to view these file types. Encamp is still a fairly new app, though, so hopefully future versions will include the ability to see file attachments. Encamp is compatible with any iPhone or iPod touch running the iPhone 2.2 software update.